Perfetto has become the fourth restaurant to fail at 617 Main St., but landlord Nick Sinatra says the next restaurant will be different. 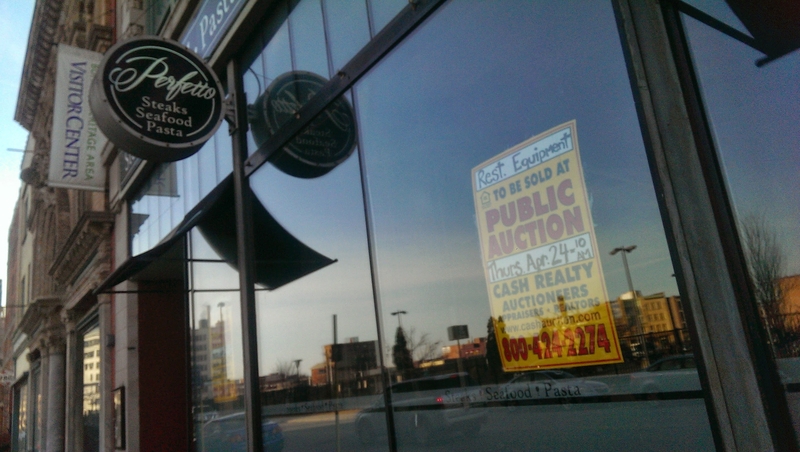 Perfetto’s equipment is being auctioned off Thursday. The 260-seat Theater District space was previously Ya Ya Bayou Brewhouse, Breckenridge Brew Pub and Empire Brewing Company. Owner Jay Haynes did not respond to requests to comment. Nick Sinatra, the real estate developer who bought the Market Arcade from the city last month, said he’s talking to three high-profile Buffalo restaurateurs about the space. Sinatra knows something about successful restaurants, having grown up around his family’s place, the veteran Italian red-sauce standout Sinatra’s on Kenmore Avenue. There should be news on the tenant by late spring or early summer, Sinatra said. The Market Arcade will be Sinatra & Co. Realty’s headquarters, and it needs a successful restaurant, he said. Diversifying: Lake Effect Ice Cream has taken the next step in freezie-pops with adventurous handcrafted beauties across the spectrum. The list of a dozen flavors includes double-double coffee, a ruby red grapefruit number called Pamplemousse, and a tart lemon-lime number dubbed Flux Capacitor. There’s even a healthy smoothie version called Power Pop, with blueberries, peaches, coconut milk, yogurt, local honey and spinach. They’re $2.50, and only available at the Lockport ice cream parlor and Lake Effect headquarters, 79 Canal St., 201-1643. Replated: The former Marco’s Deli sandwich shop at 3024 Delaware Ave., Kenmore, has changed its name. It’ll be Joe’s Panini Grille, said owner Joe Carriero. “The menu’s basically the same,” he said. Moving: Arriba Tortilla, 591 Main St., East Aurora, will be moving to 40 Riley St., around the corner. The new location will offer more seats and more parking, said manager Robert Kuczmar. “Probably the first week in June we’ll be open there,” he said.